7/11/2015 - Retroactive bonus Saturday post. 'Bonus' because these are just renders of ideas we've already discussed for Tesla recently. We've also discussed a version that lets you choose any of the exiled cards. That might be wordier and is harder to balance, but could well be worth it. Rummage is meant to be smoothing that allows players to hunt for expensive cards when they need them, as well as more standard smoothing needs. I think Experiment has a solid idea at its core, but the implementation we have now feels a little clunky and odd. 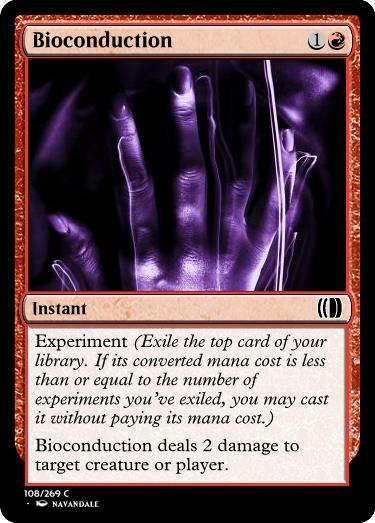 I previously spoke about how its awkward that the cards exiled by Experiment abilities are also called experiments, since "number of experiments you've exiled" become kinda ambiguous... but other than that (admittedly pedantic) issue, I think the mechanic is relatively fine. It's a cool way to build up progress towards a bounded goal (the biggest CMC in your deck) while including lots of variance in what exactly happens as you work your way towards that goal. Rummage I am a big fan of. I think this is quite the interesting smoothing mechanic. The problem we face, yet again, is the term 'CMC'. One solution I just thought of is to treat CMC as if it was a keyword, in terms of complexity at common. Keywords, as we all know, are vocabulary terms that players learn the meaning of within the set - so CMC isn't too far off from that definition. Perhaps reminder text alongside CMC might work. (The converted mana cost of something is the amount of colorless mana in its cost plus the amount of colored mana in its cost.) That seems kinda unwieldy, though. Anyway, Rummage itself is a great mechanic, especially if we end up pursuing the CMC themes we've discussed previously. I think the top 4 might be a little much - three might be better - but other than that it's cool. Should it have a number, a la Scry? Or are we going to stray so little from 4 that it's fine as-is? 'Total' really does seem to imply that it takes into account adjustments, reductions, and so on. So it doesn't seem like the best term. The problem is that it's just not an easy concept to unambiguously express with any flavor. "Base mana cost" is about the best thing I can come up with, and that's still vague and not very useful of a term. 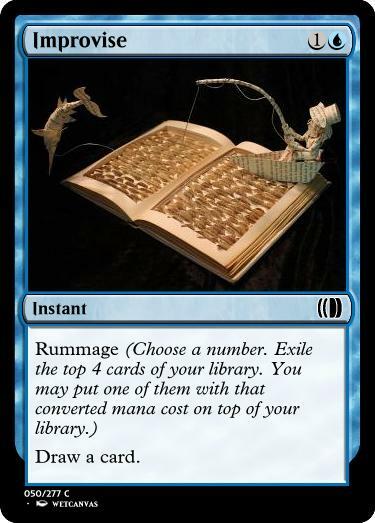 I don't like how much Rummage wants you to remember the exact contents of your deck. This is very punishing to new players. I'd really prefer it be a fixed window, or something like "choose 4 or less or 4 or more" etc. Rummage will be stronger for a player who remembers the exact contents of their deck, and who can work the probabilities, but it's entirely functional as long as you can remember anything about your deck at all. Ideally, "Do I have any removal? What does it cost?" but "I'm pretty sure I've got a five-drop..." will do in a pinch. 4+/4- doesn't seem to solve that problem, and it prevents us from getting land. I'd rather go back to "reveal top 4 and take the most expensive." Land is 4 or less. 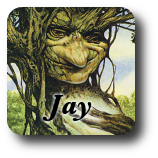 4+ or 4- was chosen to narrow the variance, and someone can make that decision without knowing anything about the deck. You show me a game state, I'll tell you want to pick. Now, if you gave me the deck list, that might change my opinion, but somewhat rarely. Do you want an early game spell/land or do you want a late game one? You know. If you show me a similar situation with your version of the mechanic I have no idea. Let's even say I know that it is late game, and I have 4 mediocre 3 drops, 2 pretty good 5 drops, and one great 6 drop. Is it fun to choose which cost to name? I'd guess that is fun for <= 5 percent of players (and that's assuming they know the numbers, which almost no one will). I really like the text "you may put [card satisfying condition] from among them on top of your deck," I just don't like the condition being exact CMC. Could it be card type? Alternative: Could it be "Land or card costing 5+?" Say you're handed a deck you've never seen and rummage on any turn you hope to have land next time: 0. You've got two land and no 2-drops: 2. You've got three land and no 3-drops: 3. You've got four land and no 4-drops: 4. Knowing the deck will tweak the heuristic, and it's not actually linear (losing fidelity as you get to 5+ land), but it seems like most players will have a reasonable play most of the time. "Land or card costing 5+" is almost identical but limits our options and connotates that this isn't some modular mechanic for players to get clever with, but some development-based fix. Though if you can find flavor that explains, that would change my opinion radically. I think your heuristic is probably very far from optimal. If I were to title the 5+ or Land I would go with something suggesting building up or filling in a blue print. You are either working towards your masterpiece by finding lands or planning the masterpiece you want. One problem with this kind of mechanic that I have found over and over in playtesting is that when you get to choose a card to put on top of your deck players (including myself) invariably end up accidentally putting the card in their hand instead of on top. What do you think of naming a card type? That feels more like rummaging to me even. Aside: Now that Scry is evergreen, do we need a smoothing mechanic? The worst possible mechanic is one that every player plays optimally every time. The range we want to shoot for is LSPs feel like they get the concept and benefit from its use and HSPs feel like they understand it better and benefit more from its use. That's pretty good flavor, actually. Card type is a solution that feels natural, and feel like I've proposed a smoothing mechanic like that before (though all I find right now is portent). In terms of general utility, it's more intuitive and potentially more useful, because we can say 'creature' when we want a body, 'land' when we need mana, and 'instant' when we need answers. It doesn't play into 'big things' at all, but rummage is pretty subtle about that anyhow. Certainly fits the name better. I'd love to playtest that. We could draw the card outright—and I agree that's more intuitive—but it's also a lot harder to develop against. Definitely agree that just saying "oh just draw the card" is not the answer (though players will complain it should have been that for sure). I was just pointing out it has been a recurring problem any time I have had this kind of mechanic. My complaint about the other version, by the way, is more subtle than that new players will play it wrong. New and experienced players will play it, realize they don't know what is in their deck, and so don't know what they should name, and feel stupid. It is the same thing I've seen time and again with cards in games (published and un) where a card asks a player to name a card in their deck. At least when Dominion does it you can look at the board and see the names of all the cards that could possibly be in your deck. I'm happy if there is a version that involves a player counting perhaps two numbers before they played, like color or odds and evens or whatever. Mulling this over, I think I'd say it concisely as "Your players, even your new players, should feel like they know what decision they want to make in the game at least the majority of the time." It is okay if what that decision is wrong "Oh, the Riot Devil is a 2/3, I should block it with my Bloodline Keeper, that is a 3/3 so it will survive!" but one of the biggest exit points for new players in any kind of game is being faced with a decision that they just don't feel prepared to make. I'm sure it has happened dozens and dozens of times in my time teaching games that a newer player has stressedly asked me what they should do in a particular circumstance. Magic (and many other games I could name) are great at this because there are easy to intuit defaults. If you aren't sure whether to attack, don't. Play the most expensive thing you can. Play a land each turn. Indeed, this is such a great strength of Magic that if you look on BGG and look at the most common criticisms of it they will inevitably include many people claiming "I don't like Magic because there are usually at most 1 or 2 decisions per game." Obviously this isn't true, but that so much of the decision making of Magic is hidden at first is one of its greatest strengths, and why so many people get sucked into it. I emphatically echo Tommy's thoughts. I really like the concept of rummaging (including looking for specific mana costs). But to me it looks like it will FEEL difficult to players, which will make them constantly feel frustrated. Sure, if you have a great curve, there may be no problem, but I imagine people constantly making the trade-offs "well, my best out is my removal at 3-cost, but I only have one of that, maybe I'm better of saying 4 anyway" and so on, as in, forced to make decisions which feel suboptimal. And SOME of that is great, it rewards players who know how to optimise their chances. But I imagine many players will just always feel bad that they guessed wrong. the term you're looking for is "gross": total before any deductions. seems too high variance and high risk of not finding what you want. with scry, you always get some benefit. not so with rummage. first you have to make a good, educated guess. then you may reveal no cards that fit your guess. furthermore, if you failed to guess right, you could have exiled a card you could have used, but didn't fit the narrow criteria of the guess. There's still opportunity for players to make the right play. There's still risk of losing other cards permanently, but at least you keep the best. Not unlike Fact or Fiction. If you're looking for a specific card or for land, it gets you closer no matter what. But I agree that it will feel bad when you just want any removal, name a 4 and see a 3. Your simplified rummage is pretty cool. Is it too similar to scry? Certainly it's less powerful on two axes, so we can make it bigger or hurt cards we put it on less. Better than scry 1, worse than a cantrip. Granted, now that scry is evergreen, I'm really not sure how much of a call there is for this kind of mechanic anymore. My main concern is that player's will often name Island just because the chances of hitting are vastly higher than naming a spell, even though they don't need more land. I like experiment. Can it play lands? As worded, no. We could replace 'cast' with 'play' but I feel like the flavor of experiment is more important than helping it be fixing.